New set photos have emerged of Samuel L. Jackson reprising the role of Elijah Price in forthcoming sequel Glass. Jackson first played Price in Unbreakable, where he was a mysterious comic book collector who becomes convinced a normal man named David Dunn (Bruce Willis) is really superhuman. Dunn eventually realizes this is true, and the film ends with him embracing his destiny – but not before he learns a shocking secret about Price. Despite Unbreakable receiving being considered one of M. Night Shyamalan’s best movies and becoming a solid financial success ($248.1 million worldwide against a $75 million budget), a sequel did not materialize for quite some time. The steady fanbase that has built around the movie were thrilled when Shyamalan (no stranger to a shocking twist), revealed at the end of Split the movie is actually set in the same world as Unbreakable and David Dunn now knows other superhumans exist. Glass will be the final film in the trilogy and will find Dunn on the trail of James McAvoy’s serial killer The Horde and Jackson’s older Elijah Price. Anya Taylor-Joy will also reprise her role from Split. 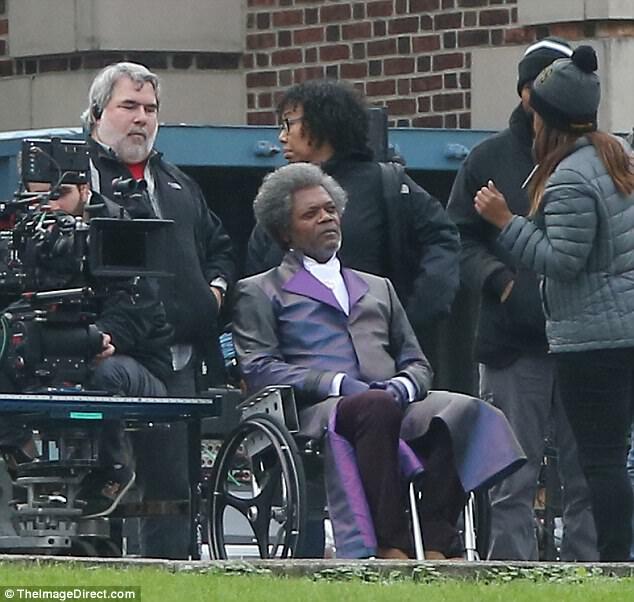 Set photos from Daily Mail have now emerged of Jackon in character on the set of Glass, and it appears Price still has a thing for purple coats. It seems like Unbreakable was ahead of its time in many ways, since it was a deconstruction of the superhero genre well before the explosion of comic book movies. That might be part of why the movie has aged so well, as it still feels relevant. It also featured great performances from Willis and Jackson, and the chance to see what happened to their characters in the years since the previous movie will definitely be exciting. Glass will also pit Dunn’s “unbreakable” hero against a genuine supervillain in the form of McAvoy’s character. This villain actually featured in Unbreakable’s original script, but he was removed during rewrites to focus on Dunn's origin. It’s great to see Shyamalan back in control of his career again. The director was once labeled the new Spielberg following early successes like The Sixth Sense and Signs, but his career hit trouble with costly misfires like The Last Airbender, After Earth and Lady In The Water. Shyamalan seems to function better with lower budgets and more creative control, with his most recent Blumhouse efforts The Visit and Split being his biggest successes in years. This has also allowed him to revisit the world of Unbreakable, and finally finish off the story nearly 20 years later. Hopefully, Glass will be worth the long wait.